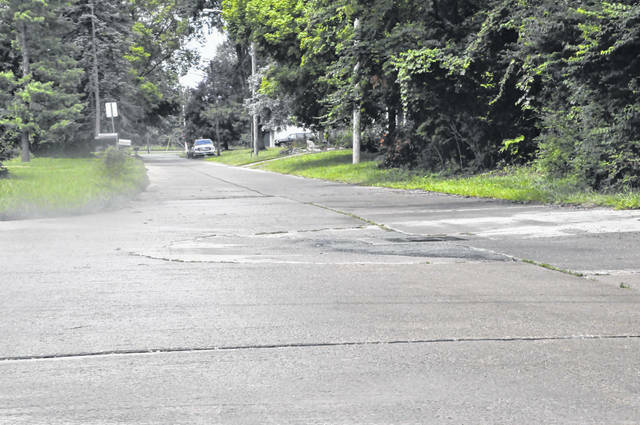 Scioto Street in Powell is just one of many roads in need of repair. City Council voted to send a resolution to the November ballot that, if passed, would increase the income tax to 1.15 percent in order to fund infrastructure repairs and improvements. After two months of consideration and deliberation on the proposed ballot measure that would raise the income tax rate in Powell, a vote was finally rendered at Tuesday’s city council meeting. With a vote of 6-1 in favor of proposing the ballot measure, city council has put the proposal in the hands of Powell residents, who will decide its fate on Nov. 6. If the proposal were supported at the polls, Powell’s income tax rate would increase from 0.75 percent to 1.15 percent, marking the first time in 27 years the rate has changed. Powell’s current rate is among the lowest in the entire state. The resolution is in response to the 18-person Citizens Financial Review Task Force’s suggestion to council in June that an additional $2 million in revenue is needed for the city to keep up with future infrastructure repairs and improvements. The committee was assembled in January and, over the course of several months, found the city had never appropriately budgeted for these future repairs. Various options were discussed, including a 4 percent cut in every city department. However, given the strain the cuts would put on the city, particularly the police department, and the fact that those cuts wouldn’t produce the necessary $2 million, the committee decided a tax increase would be the only feasible solution. In addition to the proposed tax rate increase, an increase of the tax credit for those who work outside of Powell from 0.25 to 0.50 percent has been attached to the ballot measure, along with a stipulation that will mandate no less than 25 percent of tax revenue be allocated for infrastructure improvements. The tax credit had been a major point of contention among some council members, as well as the public. In particular, Powell residents who work in Columbus would have one of the highest effective tax rates in the state. Columbus’ income tax rate is currently 2.5 percent. Councilman Brian Lorenz proposed an amendment to set the tax credit to 0.65 percent in order to lessen the burden on Powell residents working outside of Powell. However, the amendment failed to gain any support from the rest of council. Director of Finance Debra Miller said such an increase would leave the city short of the $2 million needed, and that money would have to come out of the city’s general fund. Councilman Brendan Newcomb, who was the lone council member to vote against the proposed ballot measure, cited recent increases in taxes due to the opening of Olentangy Berlin High School and speculated with the increase in students that future increases in property taxes would be needed to fund additional schools. “Given that, I don’t want to propose an additional burden on the citizens,” he said. At last week’s special meeting of city council to have additional discussion on the proposal, Councilman Daniel Swartwout questioned the need to hastily push the resolution to the fall ballot. The deadline to get the resolution on the ballot was yesterday, just one week after the special meeting and less than 24 hours after Tuesday’s meeting. On Tuesday, Swartwout doubled down on his opinion that council was unnecessarily rushing. While Swartwout was adamant the proposal could use more time, before voting in favor of the resolution, he took the opportunity to clarify that a vote in favor of the proposal was not a vote to raise the income tax in Powell, mainly because that power does not lie with city council. Rather, the vote is to give it to the residents and let them decide whether they will support it or not.